Meet Ove. He’s a curmudgeon (bad tempered or surly man - I had to look that one up!) —the kind of man who points at people he dislikes as if they were burglars caught outside his bedroom window. He has staunch principles, strict routines, and a short fuse. People call him “the bitter neighbor from hell.” But must Ove be bitter just because he doesn’t walk around with a smile plastered to his face all the time? Oh! The PRAISE you see above is so true! This is a truly remarkable story! I HIGHLY suggest reading this! It gets you in the heart. It's different in the sense that this is a MAN who is the main character, and he's just a little different! You can't help but to love him and all of his quirks, even though he's the meanest man you may ever meet, but then again perhaps this is what draws us to this book so much. Forget The Rosie Project! THIS is the book to be reading! Young Ove follows in the footsteps of his father as he lost him in his very early teens, but his father left such a positive impression upon him, he follows what he was taught. His father didn't really seem to have a backbone, yet then again he preferred to avoid any type of altercation whatsoever because that is just how a real man acts and sets examples by - not by being a bully in return. He just wants to do what a 'man' does is right. Ove learned from his father, but sometimes your heart just reaches out so far for him because when he should be standing up for himself, he doesn't do it. You would think he is a pushover, but he isn't. He is just like his father. He is doing what a real man would do, or so he thinks. Ove has quietly taken on bullies, or rather put up with them, taken the blame for stealing at work when the adult bullies have accused him of doing wrongful things, he just takes it when he would 'never' steal, and steal is not even in his vocabulary. Again, my heart pours out to him! I wanted to yell at him and tell him to open his mouth and tell the truth, but Ove wouldn't do that because a real man just does not do this. The funny part about this entire book is Ove just wants to kill himself, and he continues to get interrupted! No one comes over for years, and now that he wants to meet his wife again, he just can't pull it off! "For the greatest fear of death is always that it will pass us by, and leave us there alone." " 'All I want is to die,' he thinks to himself and presses his toes into one of the floorboards. " "People had always said that Ove was 'bitter'. But he wasn't bloody bitter. He just didn't go round grinning the whole time." As Ove gets older, this is when he starts to change (mostly because of the death of his wife), but he becomes more bitter about life and people. The sad part is he is just such a sad man without his wife, Sonja. We learn all of this through flashbacks. This is the one thing that confused me a little at times at first in the beginning. Everything is told in flashbacks. 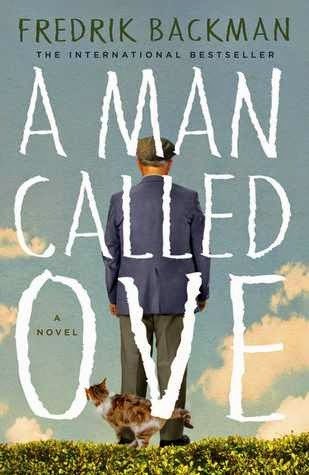 (I found myself wondering how Ove and his wife met, but found out I missed that part where he meets his wife, the courtship, and the wedding when I accidentally set my Kindle down and flipped through a few chapters. I had to go back and reread what I missed! You 'have' to read his love story!) It was SO sweet, that no wonder he wanted to die without her. With that being said though, for those of us who are desperately in love with our spouses, wouldn't we also feel the same way? Although I don't think we would as far as Ove did trying to kill ourselves! Although I could be wrong, too. There just might be lonely enough people out there who do want to die without their spouses. This is a great book to enjoy. You may find a few quirky parts, but remember this author is from Sweden, so they have different sayings, their government works different there, etc. You'll adjust! This book sure gets you thinking about things. What is important about life, work, etc. This book IS sad, too. It's off the beaten path because it is so different, but don't let that stop you from reading it. Enjoy this story! It's guaranteed! You'll be glad you read this one! I received this book for FREE from the Publisher, Simon and Schuster, and NetGalley, in exchange to read and write a review about it. "Free" means I was provided with ZERO MONIES to do so, but to enjoy the pure pleasure of reading it and giving my own honest opinion no matter whether it is positive or negative. I am disclosing this information in accordance with the law set here: http://www.access.gpo.gov/nara/cfr/waisidx_03/16cfr255_03.html., The Federal Trade Commission's 16 CFR, Part 255, 16 CFR 255, Guides Concerning the Use of Endorsements and Testimonials in Advertising Federal Acquisition Regulation. I don't read much contemporary but this sounds too good to pass up. This book is truly one of a kind! It's SO sad, yet has it's bright moments, too! It really is a good emotional read! All this poor man wants is to kill himself because he can't face life anymore since his wife died because she truly brought out the best in him and he loves her more than anything in the world, but every time he tries to end his life, someone interrupts him! It's kind of funny in a way, goes to show him he can't get what he wants, but the people who come into his life he finds out he can't live without them, either! This is a truly heart touching novel! Thanks for leaving a comment! Please let us know how you like it, too!